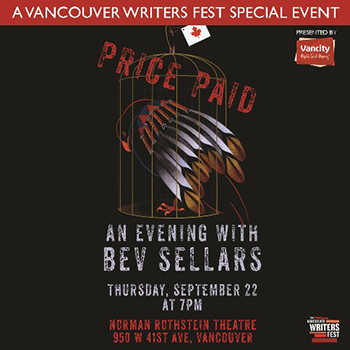 Price Paid is newly published, and author Bev Sellars is in town! Join her tomorrow evening to celebrate the launch of her highly anticipated new book, Price Paid: The Fight for First Nations Survival. Hear how North America’s Indigenous peoples have contributed to the rest of the world; uncover the dark period of regulation by racist laws during the twentieth century; and explore how Indigenous land and resource rights are being re-established today. Following her groundbreaking and award-winning debut, They Called Me Number One, Sellars offers a personal, candid and eye-opening clarification of misconceptions still widely believed about First Nations people. The event takes place on Thursday, September 22 at 7:30 p.m. at the Norman Rothstein Theatre (950 West 41st Avenue) in Vancouver, British Columbia. Tickets are still available through Theatre Wire. Then, tomorrow, join Bev for a discussion about the history of Indigenous activism in Canada and her new book. The event takes place at 3 p.m. on the afternoon of Friday, September 23 at the Central Branch of the Vancouver Public Library. Find this event on the VPL website.